Checkers and Rally's latest menu item is the new, limited-time Roadhouse Baconzilla--a combination of the Baconzilla and the Bacon Roadhouse. They've also discounted the Checkerburger/Rallyburger with Cheese to $1 for a limited time at participating locations. The Roadhouse Baconzilla features two beef patties, bacon, crispy-fried onions, American cheese, Cheddar cheese, ranch, and barbecue sauce on a toasted Kaiser bun. 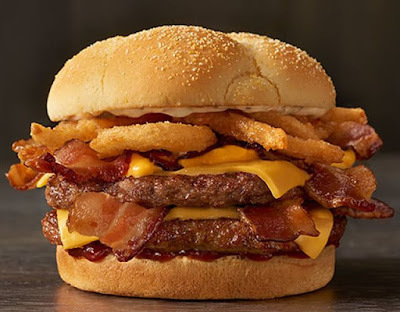 It's more or less a bigger version of the Bacon Roadhouse burger.